Trailer Brakes are an essential part of any towing setup. 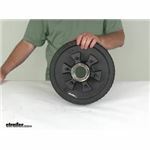 Dexter offers many different electric drum brake assemblies, with weight capacities up to 12000 lbs and some are self-adjusting. 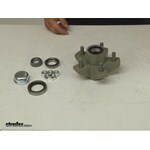 Dexter also has hydraulic drum brake assemblies for your towing needs. These also have weight capacities going up to 12000 lbs and Dexter has single servo, duo servo, and free backing brake options. 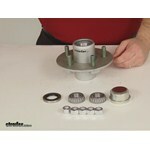 Dexter is guaranteed to have a hub or a hub with an integrated drum that will fit your application. These are rated for all the way up to 10000 lbs axles and Dexter offers everything from standard to agricultural applications. 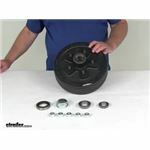 To get the smoothest ride possible, Dexter has a trailer suspension kit for tandem-axle trailers, as well as a variety of equalizers and hangers to complete your trailer suspension set-up. Dexter has a proportional controller, as well as electric to hydraulic brake controllers, to keep your trailer safe and within DOT standards and federal braking requirements. 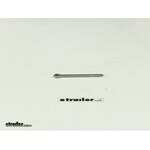 If you have one of the Dexter Electric to Hydraulic Brake Controllers, the Trailer Breakaway Kit is a must! If your trailer is disconnected while towing, this system will bring the trailer to a stop. Yes, you could use flange nuts with wheel # LT589DMPWX but the hole size on this wheel is 5/8 and the hub and drum # 8-219-13UC3 has 9/16 inch studs. 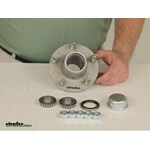 For a similar hub and drum with 5/8 inch studs you can use # 8-219-18UC3. 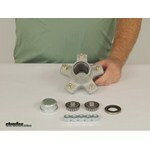 It has the same bolt pattern and uses the same bearings and seal. It just has the 5/8 inch studs instead of 9/16. What is the Correct Hub Replacement for Dexter 8-208? 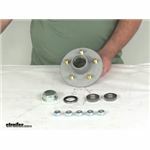 For a hub/drum with a 3,500 lb capacity and the bolt pattern of 5 on 4-3/4 inch like you said you need you'd want the Dexter part # 845476UC3 which would fit and work well. 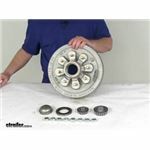 The drum size is 10 inch and for assemblies you'd want the # 23-468-469 for self-adjusting assemblies for both sides of the trailer. I have found a hub for you. 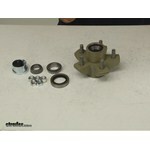 The Titan Trailer Hub Assembly, # T1721400042, has a 5 on 4-1/2 bolt pattern and uses the LM11949 bearing o the outside. 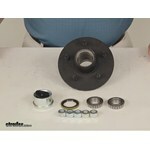 The inner bearing is a LM67048 and has an inside diameter of 1-1/4 inches. 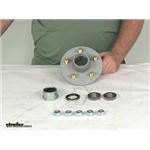 This hub is rated for 2,500 lbs trailer axles and will include both bearing, races installed in hub, grease seal, dust cap and new lug nuts. 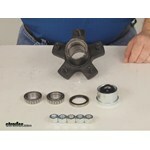 It looks and sounds like your spindles take inner bearing L69149 and outer bearing L44649. 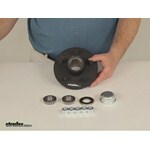 These bearings indicate that the most likely size hubs you will need are for a 3,500 pound axle. 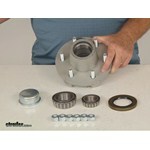 For an idler hub you could use # AKIHUB-545-35-K. This one has a 5 on 4-1/2 bolt pattern. 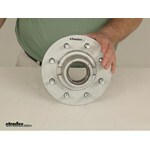 If you are looking for a brake drum then you could use # AKHD-545-35-K which also has a 5 on 4-1/2 bolt pattern. I have linked videos of both of these assemblies for you. 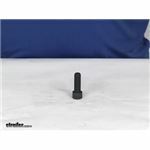 We have brake line # T0776500 that is fitted with 3/8"-24 thread UNF male and female fittings on the ends. This is pretty much the standard size for brake lines used on trailers; 3/8-24 with 3/16 fittings. 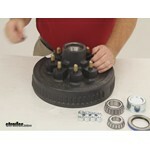 An auto parts store is sure to have any adapter fittings. I have also included a link to all of the flexible brake lines we currently offer. 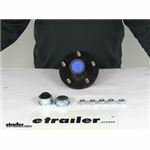 Tandem axle trailer equalizer kit # HAP-258-01 isn't a 2-piece equalizer set. It has 2 equalizers and 2 hangers. The equalizers are 14-1/4 inches long though. 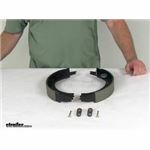 If the recommended spring is longer than the old springs then the equalizer kit still may work for you. 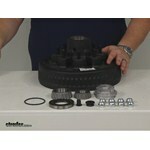 Otherwise we have kits with longer equalizers including # HAP-158-258-02 which has 18-3/8 inches long equalizers. Your original rims are the hub-centric type, meaning that the pilot hole in the center of the rim provides the centering for the rim on the hub. In the lug-centric type that you are switching to the centering of the rim on the hub is provided by the alignment of the lugs. As long as your new rims have a pilot hole that is larger than the center of the hub (to fit over it) and your wheel studs line up and thread on properly then you are all set. 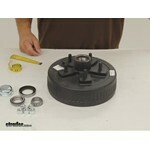 It is easy to tell which type of wheel you have on your boat trailer. 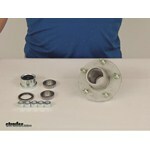 Lug centric wheels slide onto studs on the hub and are secured with lug nuts, like a car tire. If a wheel is hub centric, the wheel centers on the hub and bolts are threaded into the hub to secure the wheel. 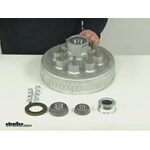 Every one of the hubs we offer with an 8 on 6-1/2 inch bolt pattern is lug-centric. See attached link to see them all. 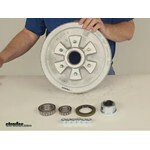 That's an older part number but I was able to find out the exact replacement you need. The hub you need is the Dexter part # 8-201-5. 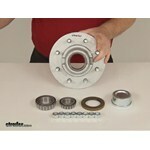 We will need to go by the bearings used in your current hub. 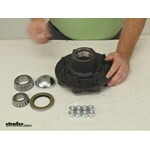 If your bearings are L44649 inner and outer then you can use hub # 8-258-5UC1-EZ. 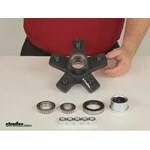 It and hub # 8-259-5UC1-EZ use the same bearings, both have a 5 on 4-1/2 bolt pattern, and both are for 2,000 pound axles. 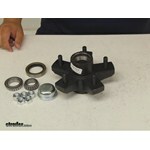 The Dexter Trailer Idler Hub Assembly for 2,000-lb E-Z Lube Axles - 5 on 4-1/2 # 8-258-5UC1-EZ does not come assembled. 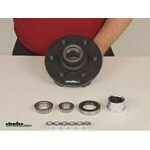 It does come with the bearings, seal, and grease cap but the only installed part is the bearing races. You would simply need to pack the bearings with grease like # L30132 and then top off the system with your grease zerk once installed.